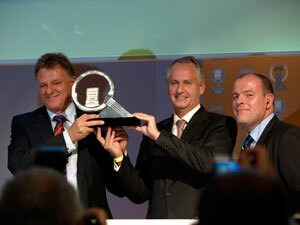 This brings up the hat-trick for Actros in the commercial vehicle industry's most prestigious accolade. The first generation scooped gold in 1997, while seven years later Actros II took the prestigious trophy and now Actros III has completed the set for the German manufacturing giant. Actros fought off a strong challenge from the Iveco Eurocargo to take the trophy, while the new Volvo FH and Scania R Series with EGR engine shared the third position. 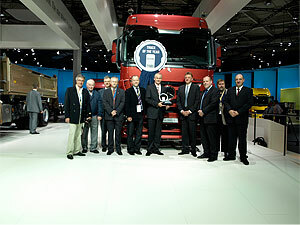 The International Truck of the Year trophy is awarded to the truck launched in the previous 12 months which is deemed to have made the greatest contribution to road transport efficiency and in the case of the Actros the improvements made to the vehicle, particularly in the areas of safety and driver comfort scored a major hit. Many jury members commented on the fact Actros is now offered with a complete safety package including laneguard system, ESP and ACC which is made available to all customers, including their own CharterWay rental company. Safety of commercial vehicles and other road users is of primary concern to everyone involved in the sector and the jury welcomes the initiatives shown by Mercedes in this area. The Actros has benefited from a number of improvements to the driveability and efficiency of the truck and this was also commented on by the jury members when making their decisions. The addition of the new automated Powershift transmission, as standard, is a major step forward in driver comfort, as is the addition of the new bunk arrangement. New Actros brings a host of improvements to the driving and operational efficiency of the truck says jury chairman Andy Salter: "The whole is very much more than the sum of the parts and it's easy to see why Actros is building a strong reputation for itself among drivers and operators. 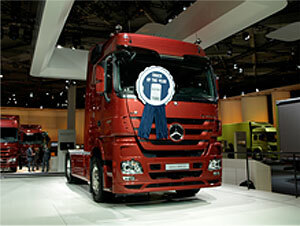 This year was a particularly strong year for new vehicles and for Mercedes-Benz to scoop gold for the third time with Actros is a tremendous achievement".